We haven’t forgotten Valentine’s Day. The market is going to hold a drawing for an Extra Special Valentines Basket. $10 per entry or 5 entries for $40. 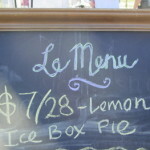 Chef Jennifer Una is back with her farmers market recipes. This week: the beet. Heat oil in medium sized soup pot. Add onion and seeds and sauté for a few minutes. Add carrot, celery and potato and sauté until soft. Add tomato paste and heat through. 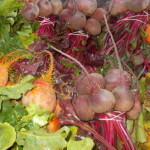 Add beets and water enough to cover by about ½”. Add bay leaf and bring pot to a boil. Reduce heat, cover and simmer until all is tender. Turn off the heat and remove the bay leaf. Add big pinch of salt and a grind of pepper into the pot. Taste soup to adjust seasonings by adding salt, pepper, apple cider vinegar to taste. Put a spoonful of sauerkraut in serving bowl and ladle soup over it. Serve with a dollop of crème fraiche, yogurt or sour cream and a sprinkling of fresh herbs if desired. The Saturday market is the super bowl of snacks. We have everything from soup to nuts. Prepared and ready to go or everything you need to do it yourself. Thinking about grilling and the carnivores: our ranchers together are the best butcher shop in Sonoma County. 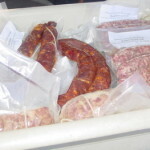 Owens Family Farm has lamb jerky and lamb salami. 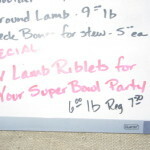 Williams Lamb is having a sale on lamb riblets. John Ford Beef will there Saturday — the best hotdogs. 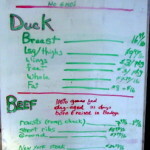 Salmon Creek Ranch duck supplier to Chez Pannise will have goat this week. Goat is another healthier option. 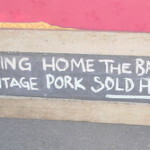 Black Sheep Farm – heritage pork . 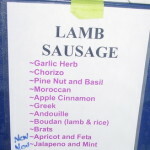 Franco’s going to have brats, a good selection of sausages and some pates. Make a beautiful platter of olives, nuts, and cheese. 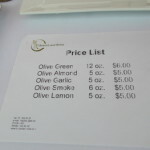 Branch and Brine has flavored olives as well as their regular ones. Weirauch Creamery and Two Rock have prize wining cheeses. If you haven’t tried Two Rock’s goat milk brie or Gruyere you are in for a real treat. The Gruyere started as a college project for the owner’s granddaughter It’s not available often, it’s worth a special trip. Hue de Laroque and Waterhorse Ridge both have great ingredients for making salsas, dips and marinades. 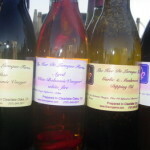 Allow extra time for tasting with these vendors. Mi Fiesta has everything you need for your super bowl party. Chips, dips, salsas, enchiladas, tamales, rice and beans. 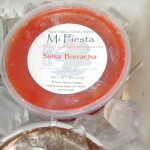 Mi Fiesta has your favorites but they also have some unusual salsas including one made with beer. 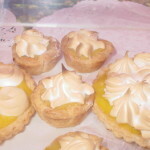 All of our prepared food vendors are caterers. You can get it to re-heat at home. 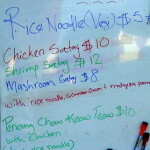 Penang Kitchen’s creations can be easily be reheated. The satays and sauce are amazing. 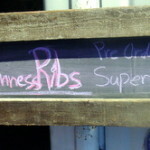 To get the Green Grocer’s Guiness Ribs, you have to call ahead 707-837-8113 . 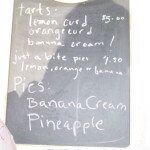 All our vendors welcome special orders. Think you don’t like walnuts? This might be the reason. 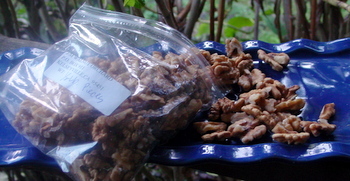 Commercial walnut processing uses household bleach to clean walnuts. Taste tests indicate people do not like the residual taste of bleach with their walnuts. 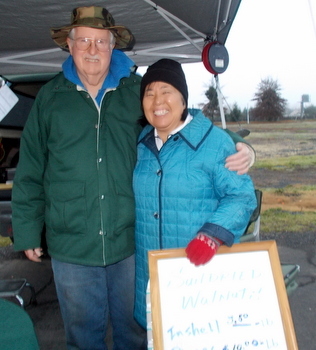 The market welcomes J/M Walnut Orchard from Kelseyville. 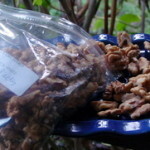 They only have slow dried walnuts – nothing added. The walnut is the only ingredient. Seasonal vendor. Wednesday January 30th — The Super Bowl or the Salad Bowl we’ve got you covered! You don’t need a map for the Wednesday market but it still has everything you need for the freshest and best vegetables and fruit. There are carrots, beets, turnips, greens, lettuces, fresh herbs, fresh and dried peppers, winter squashes of all shapes and sizes,big sweet onions , tomatillos, and scallions, eggs, beef, lamb, goat, and pork – sausages and a whole bunch of different kinds of bacon. There’s more too! Getting to be the last of the persimmons but new citrus is coming in all the time. 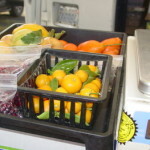 Now grapefruit, blood orange, pomelos and lots of lemons of all kinds. We’ve got two bakers and great coffee for a quick pick me up. 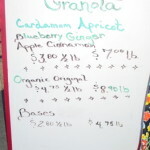 The Green Grocer is in the house – no matter what you pick it will be the best breakfast you’ve ever had. The market has a lot of red and gold –getting ready for the 49’ers. Red and gold beet salad — looking good and tasting good too! 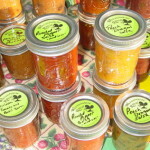 Check out Waterhorse Ridge – a great collection of jam,salsas, chutneys and just cool stuff. 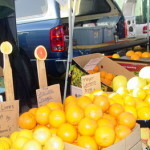 Armstrong Valley Farm has beautiful blood oranges for the perfect 49’er cocktail not too mention Bearss limes and meyer lemons. Tom also has carrots that fit perfectly in the color scheme. If your only interest is in the salad bowl Min Hee Hill Garden has beautiful, crisp lettuces. We aren’t just a pretty face. Our vendors are the best at what they do. Even though it’s winter, there’s no problem eating locally in Sonoma County. 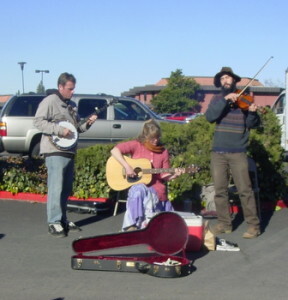 The Santa Rosa Original Certified Farmers Market has the most diverse collection of local farmers. ranchers, chefs and crafts people. This is the vendor map for Saturday January 26th. 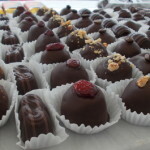 Valentine’s Day: so many choices at the market! 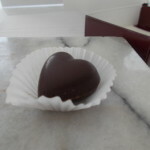 Valentine’s Day is coming soon. No panic! 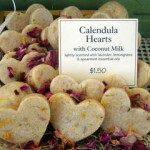 The market is filled with both traditional and non-traditional gifts for your Valentine. 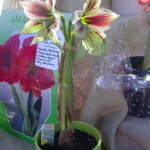 Shown here is a very unusual amaryllis from Daffodils, Dahlias and Lily’s O My! Savita also has bright red for the more traditional. 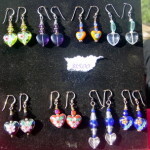 Heart-shaped things are always at the market, shown here are heart shaped soaps from The Garden Wild, and lovely heart-shaped earrings from Willow Design. These vendors are at both the Saturday and Wednesday market. 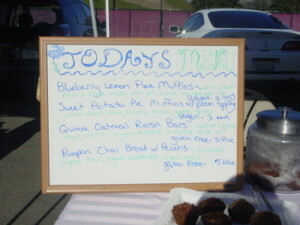 For procrastinators, Valentine’s Day is on a Thursday and all three of these vendors are at the Wednesday market too. Today marks the beginning of the season of the best-ever-winter tomato grown anywhere. 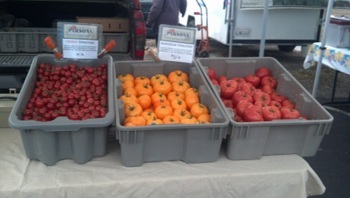 They are never refrigerated and taste remarkably like a summer tomato grown here. Kelley Parson’s greenhouse is less then three miles from Luther Burbank Center for the Arts. Chef Una used white beets from Min Hee Hill Gardens. Min Hee is at both the Wednesday and Saturday market. 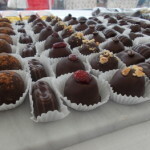 The best way to get a complete taste of Sonoma is at the Santa Rosa Farmers Market. Don’t have time to get to the olive festival? We have Branch and Brine – wonderful locally cured olives including some cured on the branch, perfect for a martini. Expand your vegetable horizons the market’s fruit and vegetable farmers have everything that’s seasonal from Sonoma County. We have all the familiar faces cabbages, kale, potatoes, lettuces. squash, broccoli, cauliflower, peppers. carrots, beets. But we have a lot for you to try too,check out the Asian vegetables at Singing Frogs. Tomorrow Chef Jennifer Una will prepare a winter root soup at 10. 11 and noon. 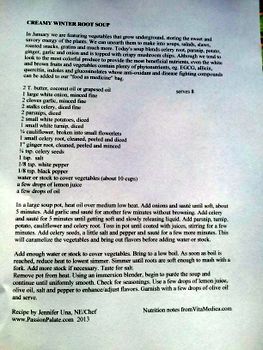 All the ingredients for the recipe will be available at the market. It’s the perfect place to pick up game day snacks Mi Fiesta is a one-stop party shop. Everything you need salsa, chips, tamales, enchiladas and rice and beans. 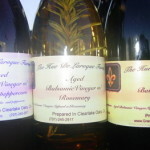 Out wine tasting? 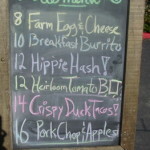 The market is located at the gateway to wine country and a great farm market breakfast is the perfect way to start your day. Or maybe just coffee and a muffin. Good Gal Delights is more than her name. 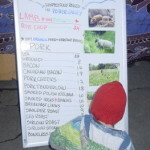 This weekend the market is Sunday January 20th instead of Saturday. If you are hosting a 49’er party – you can pick up wonderful no hassle game day party food. 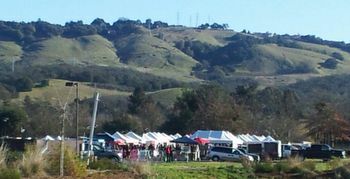 If you could care less about football, the market is located at the gateway to wine country – kick-off a tour with a great farm market breakfast. 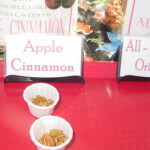 EGB has wonderful fresh fruit but be sure and sample the flavored almonds — tequila lime is great. 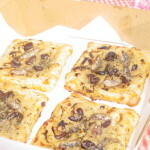 A new and very popular item is the ice box pie from The Green Grocer. Bring this pie to a game day party and you will be invited back every time. Penang Kitchen specializing in Malaysian Street Food is worth a try. They are introducing new things all the time. 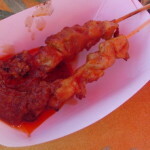 Last week they introduced a variety of satays and they are all good. The sauce is spicy and full of flavor. Mi Fiesta can be a one-stop for all your party needs– chips, salsas, rice, beans, enchiladas, tamales — pretty much everything but the beer. Our farmers, ranchers,chefs and artisans are ready to serve you. They welcome special orders. You can find their contact information here.